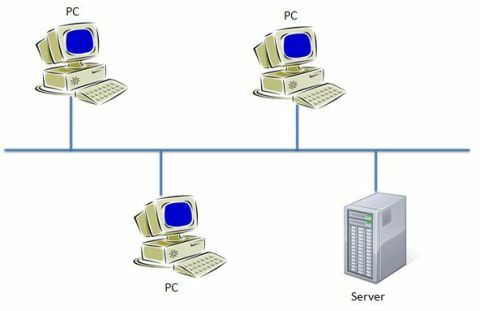 What is a computer network? If you are reading this, then you are probably connected to a computer network. 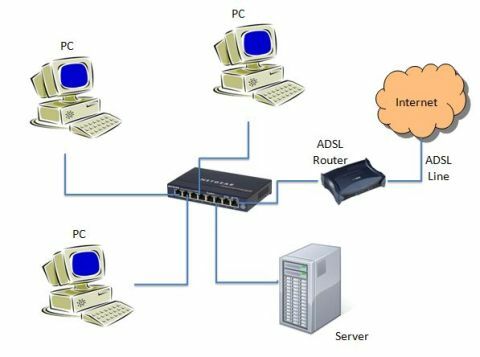 A computer network is basically a group of computers that are connected via a physical bunch of cables, or via wireless equipment. Let's first look at a traditional computer network. Let's say you have a small business with about 5 computers in the office. All you want to do is share information between each other and maybe you want to store some of the files in a central server. Some time ago, actually a long time a go, this could have been done by physically connecting these computers together using coaxial cable with t-piece connectors. At the ends of these connectors you would then use terminators to, well, terminate or stop the signal. These connectors were known as Bayonet Neill–Concelman or BNC connectors. The computer needed an add in adapter that had this BNC connector on it. These card were pretty common at the time. They were also called, combo cards, cause they also came with a RJ45 connector as well. Below is a picture of the BNC connectors. 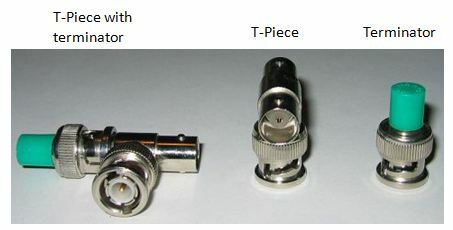 You would connect the T-piece to the computer and then connect the coaxial cable with BNC connectors at both ends of the T-piece. One end would go to another computer and you would normally terminate the other side or take to another computer. This would continue until all computers were connected. Fairly simple to setup, but quite difficult to trouble shoot. The connection problem were never at the point where you thought the problem was. It was always somewhere else. luckily we don't use this way to connect computers anymore, although the BNC connectors and coaxial cables are still used in radio, television and test instrument equipment. So, let's have a look at how we connect computers together. First of all let me show you a typical picture of a computer network. Below is a picture representing a typical network. As you can see, this is a very simple and easy to understand picture. All the computers are connected together via physical cables. There is also a server just to show you that a server connects to the network just like any other PC. This is a typical example of a Local Area Network or LAN. These systems will now share information between them such as documents or music or whatever it is they share. Instead of everyone keeping a copy of the same file on every computer, they can also save the file on the server to keep one copy in a centralized location. This could save space on your PC. The server might also be a web, mail or directory server. This is typical for a small office setup. But how do we connect these computers together? The most common way is to use a network switch. A switch is a device that has multiple ports so you can connect multiple computers to it. The most common type of connection is the, RJ45 connectors. You can go to any PC shop and just ask for a network cable. If the sales guy doesn't know what you are talking about, then he shouldn't work there. Then tell him this, "I need an Unshielded twisted pair cable with RJ45 connectors on both sides, please"
UTP cables are very common in networking. RJ45 connectors are just as common. So, we need a switch, some PC's with network cards and some network cables. You then connect your PC to the switch via the network cable. It is really that simple. Below is a picture. Network switches are pretty common these days. Some time ago, network hubs were used instead of switches. 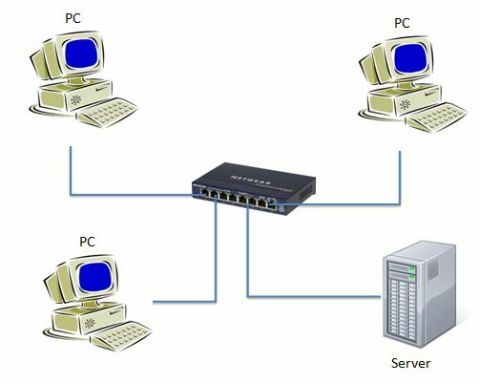 The difference between a switch and a hub is a hub shares the total bandwidth between all it's ports. On a switch, each port runs at the advertised speed. If the switch is a 1Gbe switch, then the ports all operate at 1Gbit. Switches are also more intelligent than hubs. It can learn and build tables of what devices are connected to what ports. This has the advantage that network packets are forwarded to the correct port instead of sending the packet to all ports. The problem here is that the users cannot connect to the internet. 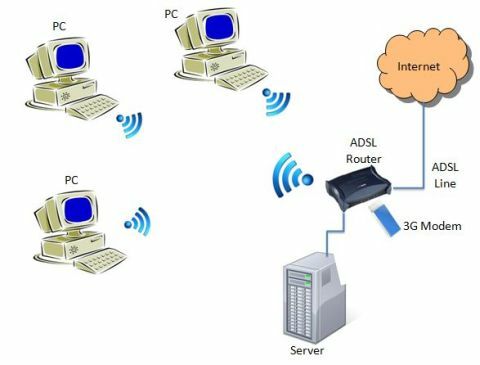 To get an internet connection, you would need a router or modem connected somewhere on the network. The router should have an ADSL (Asymmetric Digital Subscriber Line). This is a physical line from the telco company that provides these type of lines. A lot of people use 3G wireless connections these days. Is easy, cheap and does not require a physical line like ADSL does. I will redraw the above picture and incorporate a ADSL router in the mix. With the ADSL installed, people can now connect to the internet and do research and play with Facebook and so on. You are now connected to the Wide Area Network (WAN). On your PC you just need to setup a default gateway in the IPV4 properties of the network adapter. We will talk about the setup a bit later. What if you don't have a physical ADSL line, or what if you don't want to lay physical cables from one room to another or one floor to another? Can I still use the computer network? Yes, we can use a technology called, wireless. This has become very popular and almost all businesses are going wireless. It's pretty simple, instead of using physical cables, we use the airwaves. Like radio. I will redraw the above picture again to show you how you can use this wireless technology. Some of the PC's are not connected to the switch via a physical cable. It connects to the router via a wireless connection. The other systems can still connect to these PC's via the router. Most computers, be it a PC, laptop or tablet, have built in wi-fi connections. It's almost become a norm for companies to have wireless networks setup. You can find this technology at airports, coffee shops and at home. It's cheap and easy to setup. We could make the above network totally wireless by using a router than can accept a 3G modem. I would not use this setup for medium to large sized networks, but for smaller networks with 5 or less systems. 3G routers have normal RJ45 ports so you could easily connect the server to it or you could also put the server on a wireless network. Let's have a look at how we could totally make this setup wireless. The router, in this case, can use either the ADSL line or the 3G modem to connect to the WAN or internet. All the PC's are connected via wireless. You could also have the physical connections to the router and then the PC's can use either the wireless or physical cable connection. The server is still connected via a physical connection. The router is at the core of this setup. You could also use the router as a firewall and Dynamic Host Configuration Protocol (DHCP) server. This means that your router could be used to protect your network from the outside and give the PC's that connect to it, Internet Protocol (IP) address at start up. Now you know why these routers are sometimes so expensive. This is all great, but how do these systems communicate with each other? This all depends on what you want to do. If you are just going to share files between computers then you just need to enable file and print sharing on the systems. 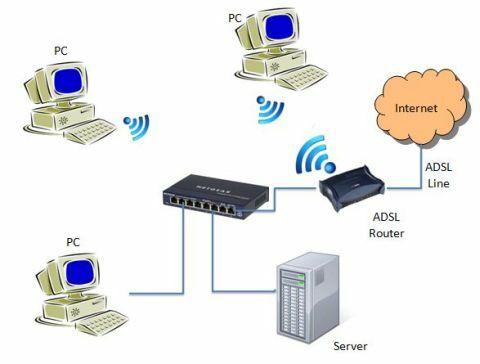 If you want to connect to the internet, then you would need to use Internet Protocol (IP) addresses. All you need to do is setup your network interface card to get it's IP address automatically. The router will take care of the rest. As you can see the answer to, what is a computer network, is quite easy. If you go into the internals of networks, you will see that it can be quite a complex topic. Especially with larger corporate networks. But this page on, What is a computer network, is just to give you an idea on computer networks and how they work.